The term ‘ovtchrka’ (also seen as ‘owtscharka’ or ‘ovcharka’) indicates a shepherd’s guard dog rather than one used for herding sheep. Primarily they protect the flock from predators, such as wolves, and thieves. Even today this breed is primarily used as a working animal. It is believed the Caucasian Ovcharka has existed in Russia and its neighboring countries along the Caucasian Mountains for more than six centuries. There are several varieties from different regions and countries, although currently most are lumped together as one breed. As with most ancient dogs their history is disputed. 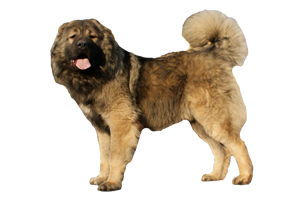 Some believe they descended from the Tibetan Mastiff, while other insist it was crossings that involved mastiffs and sheepherders. Lastly, there is a common debate that they are in reality a ‘native’ breed, created in isolation from outside influences. Is the Caucasian Ovcharka Right for You?